This Information Sheet provides more information on Topic 4: Calculating and comparing costs and benefits and using project management tools. The assessment of costs and benefits informs planners on ‘when and where to act and how to prioritize and allocate scarce financial and technological resources’. The table below summarises the key differences between CBA and CEA. There is a single objective. The costs and benefits can be indicated in monetary terms. The benefits cannot be indicated in monetary terms, such as those related to human health, extreme weather events, freshwater systems etc. and the costs can be indicated in monetary terms. Allows for comparison of diverse impacts using a single measurement. Allows for comparison of most cost effective adaptation option. Excludes non-market costs and benefits as it is difficult to obtain reliable estimates of things that are not valued in markets, such as social or cultural values. All benefits must be measured and expressed in monetary terms. Does not address equity issues and how the adaptation options are distributed across stakeholder groups. Cannot be used on its own. Must be used in combination with other dimensions to facilitate sound selection / decision making, e.g. consideration of equity, feasibility or co-benefits, as agreed upfront (because it is not a multi-factor project selection technique). Selection of the appropriate discounted rate relies on accurate forecasting of the interest rates and cash flows. It does not evaluate whether the intervention is justified (as does not make use of benefit-cost ratio or IRR). Can be difficult to obtain necessary data. Refer to Information Sheet 2.1: Defining adaptation objectives and activities. In Information Sheet 2.1, we look at broadly at the process for establishing a baseline for a programme. Here, we will look more specifically at using baselines in the CBA and CEA process. 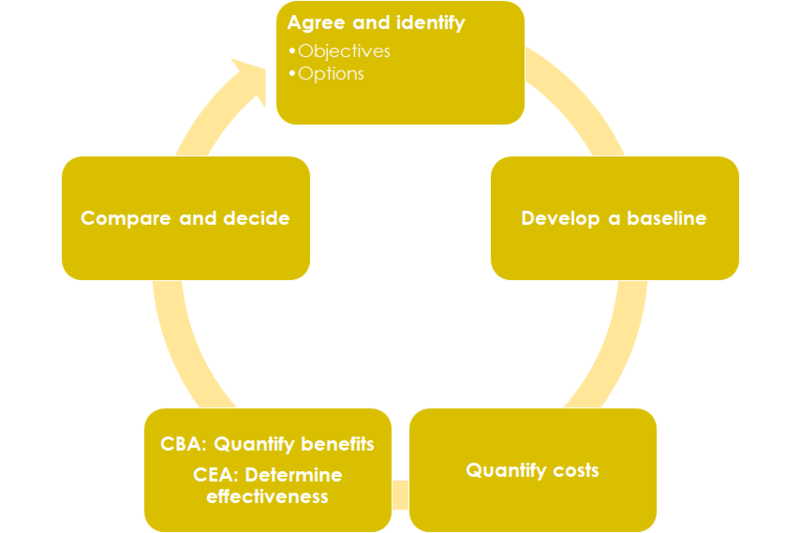 In this section, you will be provided with a broad overview of scenario planning and the process, before engaging in scenario planning as part of the CBA and CEA process. CBA and CEA involve asking: ‘what would happen if we do nothing or do not implement any interventions?’, and ‘what would happen if we do implement an intervention?’. Simply put, you will be creating ‘pictures of the future’, one based on whether no action is taken, and another based on whether a particular action is taken. This is a form of scenario planning. The ‘no action’ and ‘with action’ pictures or scenarios allow for a vivid depiction of what the future would look like in either case. The longer the time frame, the more uncertain either picture will be, as many variables will impact on results. So it is better to have a firm and fixed time horizon. It is also true that it is highly unlikely that one single, definitive picture of the future can be stated with absolute certainty. What is more likely is a broad understanding of the likelihood and the impact of certain actions or of a lack of action. 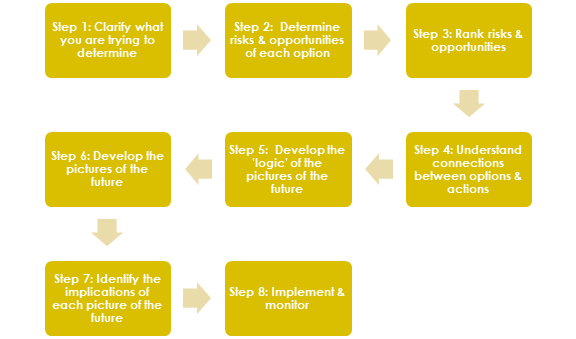 The scenario planning process allows you to establish pictures of the future based on established fact. Available data is used to develop each option / description of the future, and thus there is a certain credibility to the ‘pictures’ that emerge, despite some elements of uncertainty. The options developed allow for fixed ideas about the future to be challenged, with some evidence in support of choices made. Also, when developing the ‘pictures’, choices made allow for a process of ‘working through’ options for action and thus make thoughtful recommendations. Anticipating the future allows for field planners and project managers to predict different futures as a result of, or the lack of, climate change interventions and the resulting impact on the environment. One possible scenario that is established is what the environment and social circumstances for areas would look like with ‘no action’. Then, when developing a picture of the future ‘with action’, it could be possible that one or two different pictures of the future are drawn up, that take account of different choices for action. In each case, the future would look different. For simplicity’s sake, we will look at two pictures of the future – one with no intervention and one with a climate change intervention. Determine the costs and benefits if the adaptation option is successfully implemented/executed, also called with or the ‘high road’ or ‘with action’. For example, using the beekeeping and orchard establishment projects, you would look at the costs (project budget) and the benefits (in monetary terms). The benefits would require you to look at the income generated through beekeeping/orchards, the potential reduction in social grants for the beneficiaries, and to quantify the benefits related to soil and water conservation etc. Determine the costs and benefits if nothing is done (i.e. without the adaptation intervention), also called without or the ‘low road’. It assumes that things will continue as is (or decline). You can make use of the process outlined above to assist you in building a picture of what this decline will look like. Remember, when using climate change modelling and VA you may have already done this. For example, if the project is focused on income generation and diversification, we can use ‘Promotion of beekeeping in Lithipeng, Khoelenya and Thaba Mokehele Community Councils’ and the ‘Orchard establishment’ projects. In this step you would quantify the costs and benefits if these communities continued to operate as they are, i.e. without beekeeping or without orchards. You can compare between two or more intervention options to determine which option offers the best ‘value for money’ or ‘return on investment’. For example, using the above examples, you can compare the beekeeping project with the orchard establishment project. This would allow you to see which of the two options offers a better return on investment. Refer to Information Sheet 2.2: Defining costs. Refer to Information Sheet 2.3: Defining benefits and effectiveness. This is a measure of worth or value added to the identified community/society by implementing/executing the climate adaptation response. Climate adaptation response interventions typically run over a period of time, and so does the funding related to these interventions. What NPV allows us to do is compare all future cash flows (over the lifespan of the intervention) in terms of today’s values. Project cash flow: this is the income less the expenditure. Present value: discount factor x cash flow. Interest rate: forecasted for each year. Project years: period of time that the project runs over. Discount factor: formula used that includes the interest rate and the period of time (in years) from the start date. Example: Comparing beekeeping and orchard development. The interest rate is 20%. This project is intended to run from 2016-2020. As such, the duration of the project is 5 years. Year 1: only 40% generate income from beekeeping in the first year, i.e. 18 farmers; their yield is XXXXX. This slow uptake is because of extended negotiation with Councils and a staggered approach to training. Furthermore, there were delays in equipment delivery in one of the Councils. Year 2: a further 20% generate income from beekeeping, i,e. 18 farmers from Year 1 and a further 9 farmers in Year 2. They have differing yields, with the 18 farmers generating more honey than the 9 farmers. Year 3: 60% are generating income and all farmers increase their yield, i.e. 27 farmers. Year 4: 60% continue to generate income and increase their yield. Year 5: 60% continue to generate income and increase their yield. This project runs from 2017-2020. This project runs over 4 years. There are 993 community members trained in orchard establishment in Year 1, areas are selected for orchards within the three Councils and the fruit trees are planted. These fruit trees take 2-3 years to yield any fruit. This means that in Year 3 only some farmers harvest fruit for sale. Because of this, the number of farmers producing fruit declines over the life of the project (as the immediate benefits are not seen). However, the yield does improve in Year 4 as farmers have learned through the process. The Internal Rate of Return (IRR) attempts to answer the question – how well is the project performing over a period of time? This means we can compare different types of projects or climate response adaptation options and see where the greatest value is generated. At the end of the day, you are attempting to maximise the value (and impact) achieved through the projects you implement. You are wanting to select projects with the highest return on investment, in this case the highest IRR. In using this measure, you establish the value of the discount factor when the NPV is zero. When comparing the two examples above, what you will see is that the Beekeeping project is a poor investment compared to the Orchard project. This is despite the Orchard project not yielding any returns in the first two-three years. By using one of these techniques, you can compare different climate change adaptation responses and select the option that offers the best return on investment. Remember, the funding pool is limited and as field planners, it is important to select projects that maximise benefit. A word of caution in using these tools – the discount rate must be carefully selected as this input impacts on the numbers you obtain and may skew decision making if chosen poorly. There may be instances where you are unable to indicate benefits in monetary terms but you can indicate costs. In this instance, make use of cost effectiveness analysis. Option 1: Installation of 300 household tanks of 2000 litres and 15m of gutters for each household. Option 2: Upgraded dam, with two communal tanks and a new piping system. Project Management in Under 5: What is a PERT Chart? Benefit-cost ratio (BCR) This is a value for money ratio. It compares the present value of the benefits to the present value of the costs over the project period for a specific climate change adaptation intervention/option. Cost benefit This is a ratio that compares the costs (in monetary terms) to the benefits (in monetary terms). Discount rate / factor This is expressed as a percentage for a particular period of time (in years) and assumes that the purchasing power of a fixed amount decreases over a period. Discounted cash flow (DCF) This is used to compare two (or more) projects with different investments and cash flow profiles over the life of a project. It takes into account the time value of money, i.e. that 100 maloti today, will not have the same worth or buying power as 100 maloti in a years time. Inflation The rise in the level of prices of goods and services over a time period which results in a decrease in the purchasing power of a currency. It is measured in the inﬂation rate, the annualised percentage change in a general price index. Interest A fee that a borrower pays for the use of money that they borrowed from a lender. Internal Rate of Return This measure determines and compares the profitability of investments. The higher the internal rate of return of an adaptation intervention/option, the more desirable it is. Net Present Value This is a measure of the value or worth added by carrying out the intervention. It looks at the diﬀerence between the present value of the benefit flows (in financial terms) and the present value of the cost ﬂows (in financial terms). For an intervention to be acceptable, the NPV should be greater than zero. Present value This is the current value of a future sum or ﬂow of money which is discounted at a specific discount rate. The discount is because it is assumed that what you can purchase now (currently) is more than what you can purchase in the future with the same amount of money. The higher the discount rate, the lower the present value of the future cash ﬂows. Time value of money This is an economic concept that puts forward that the same amount of money at the present time is worth more than the identical sum in the future. It is based on the assumption that money can earn interest.